In the early 1990s, the comics boom was fueled by the likes of the X-Men, Wolverine, the Punisher, Ghost Rider, and especially Cable, the time-travelling, Terminator-like cyborg superhero with a mysterious past (and future). Created by Rob Liefeld, Cable's big robotic muscles, rectangular guns, and thigh-pouches came to represent the quintessential 1990s superhero cliche - so much so that Magog in Alex Ross's Kingdom Come was designed as a parody of the character. Rather than jumping on board the bandwagon, the editors at DC decided to show readers what it would be like if DC's classic heroes were "modernized." Batman was out of commission for a while in the Knightfall storyline, which saw the Bat-mantle taken up by a newcomer named Azrael, whose Joe Quesada-redesigned costume sent fans screaming back to their 1970s Batman trades. As for Superman, after his "death" at the hands of the very Image Comics-esque Doomsday, Superman was replaced by four heroes - a hip young teen, a Cable-like cyborg, an urban hero of the streets, and the borderline insane Eradicator. 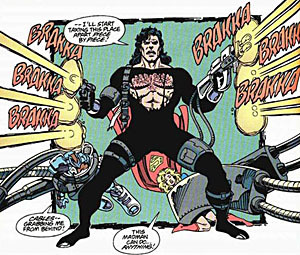 When Supes himself returned, he was initially dressed in a black "recovery suit," and since his powers hadn't returned to him, he equipped himself with some very Cable-style guns. If the sight of Superman opening up with two redonkulous guns while wearing bandoleers and thigh-pouches makes you laugh (or cry), good! That was DC's plan all along. Just a few pages after this panel, Superman gets his powers back and returns to the traditional blue, red and yellow togs we know and love (though he keeps the mullet for years afterward). Nonetheless, the black suit has become one of Kal-El's more popular looks, and has been seen in both comics and cartoons following the "Death of Superman" storyline. 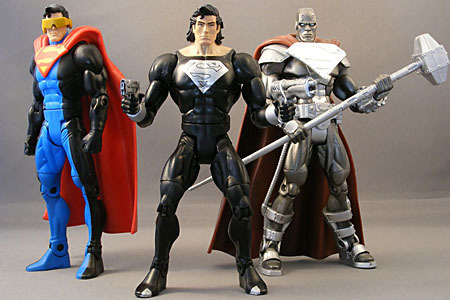 Mattel and the Four Horsemen have already made figures based on Steel, Cyborg and the Eradicator, so it's not surprising DCU Series 6 gave us both the be-mulleted Superman and this black-suited variant. When the menace known as Doomsday came to Earth, it fell to Superman to battle him to a standstill... and the death! Though it cost him his life, the Man of Steel saved his adopted homeworld. Superman's death activated the Eradicator, an entity from Krypton, who assumed Superman's identity and placed the body of the fallen hero in a suit designed to reignite the spark of life in the Last Son of Krypton. I really like the black plastic used for this figure. It feels solid and durable. It's not too glossy, like Batman Beyond, or too matte like Black Manta. There are only a few paint applications - the head, the chest symbol, the bracelets and the toe-guards. For the most part it's all fine, particularly the symbol - the black lines aren't smudged at all. The part where the suit meets the shoulders is a little sketchy, but that's about it. Recovery Supes has the same basic body sculpt as the red-and-blue Superman, minus the cape and boots and plus the bracelets and odd little (painted) toe-guards. The one disappointment is the lack of open hands. I realize Superman is best known for punching things, but this particular Superman is remembered for actually carrying guns. Some open hands to better facilitate weapon-holding would have been great. Of course, on that note, there are no accessories (other than Kalibak's left arm and club). It's disappointing since, as mentioned above, this version of Supes is remembered for carrying guns. The BAF arm is large, with a wrinkled green sleeve covering the entire thing, plus a thick glove on the hand. The arm, meanwhile, does get an accessory: a heavy golden club. While I loved the DCSH Superman when he was released, in retrospect, it does have a few problems: his looks are perhaps a bit too chiseled, his head is a wee bit too small. This facial sculpt is definitely better - larger and a bit softer, without the razor-like edges of the earlier figure. He's also rocking some shoulder-length hair, and let's face it, that's not anyone's image of Superman. Supes wore this look for a few years after coming back from his "death," which was apparently the occasion for some sort of midlife crisis. He didn't crop his hair to the classic spitcurl 'do again until he married Lois. The paint work on the head and hair is good, though, particularly the blue drybrushing on the hair. It seems every single black Superman had reversed biceps - apparently because the biceps themselves were stamped with the wrong "L" and "R". Whoops. With a little effort, you can swap the biceps by heating them up (either with a hair dryer or in a pot of hot water), popping them off at the top of the bicep, then heating the elbows, taking them apart and swapping them. It's a pain, but once it was done, I was very pleased with the quality of this figure. The paint applications weren't sloppy, there were no stuck joints, and the figure feels very durable. If he had come with open hands and guns, Recovery Suit Superman would easily have been a must-have figure. As it stands, he's slightly better than average thanks to his good quality control and paint applications - and, for some reason, I just really like the figure. Incidentally, I discovered an easy fix for the hand issue. 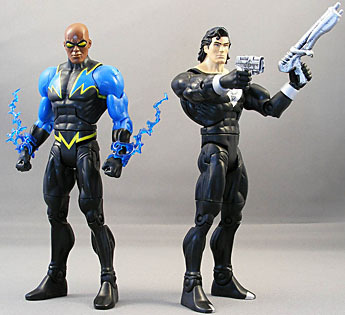 If you're lucky enough to own Black Lightning, you can just swap his hands for Supes'. They have about the same level of glossiness, and Black Lightning looks better with closed fists anyway. 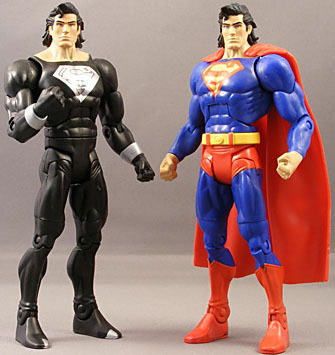 The only problem is Supes's fists have pegs that are a little larger than BL's, due to the bracelets. BL's hands will fit in Supes's forearms fine - they'll be a little loose, but it's not too bad - but you'll need to trim the pegs of Supes's hand to get them to fit in BL's forearms.